On Friday, the State Water Resources Control Board released proposed emergency regulations that would streamline the process for curtailing diversions by junior water rights holders in order to protect the supply for senior rights holders. The new emergency legislation outlines criteria the State Board will use in order to determine whether water is available under a diverter’s priority of right. If the water is not available, the State Board may issue curtailment orders, which – unlike curtailment notices – can incur fines for noncompliance. In its Findings of Emergency, the State Board outlined why these regulations are needed to effectively curtail diversions and to expedite water transfers, something the Governor’s April drought declaration required the State Board to do. Under existing regulations, water users lack sufficient incentive to comply with curtailment orders. This lack of incentive, in addition to administrative delays related to the curtailment process, could result in continued diversions, impacting senior water rights holders. Within seven days of being issued a curtailment notice, water rights holders must submit a compliance certification form, indicating they have complied with the curtailment order. As of June 20, only 21% have submitted the form. Another new survey shows Californians are concerned about the drought and a majority consider drought conditions to be the “new normal” in the state. California Department of Fish and Wildlife is releasing trout and steelhead fish from hatcheries on the American River earlier than expected; low water levels as a result of the drought are causing increased temperatures, which can be lethal to the fish. In other American River news, water flows into the river from Nimbus Dam were increased last week in order to help inhibit saltwater intrusion into the Sacramento-San Joaquin Delta. Last Monday, a state appeals court restored the power of the State Board to restrict water use by grape growers. Although a Mendocino County judge previously ruled that the State Board lacked authority, the First District Court of Appeals in San Francisco ruled that the board has the power to stop growers from “using water in an unreasonable manner” and to decide when the protection of wildlife habitat outweighs growers’ needs. A survey conducted by the State Board shows that, statewide, California has cut its water use by 5% since January, compared to January-May average water use over the past three years. The Regional Water Authority – a joint powers authority formed to promote collaborative water management in Sacramento, Placer, and El Dorado counties – reports their region has cut water use 18%compared to the previous two years. The California Department of Forestry and Fire Protection (CAL FIRE) is banning burning on 31 million acres of California state lands. The number of fires CAL FIRE has responded to so far this year is up 70% from the historical average. UC Riverside posted a short, interesting video of Richard Minnich, a professor of Earth sciences, discussing the 2014 fire season in Southern California. Nearly 33% of California is now in exceptional drought, up from nearly 25% last week, according to the U.S. Drought Monitor released last Thursday. The U.S. 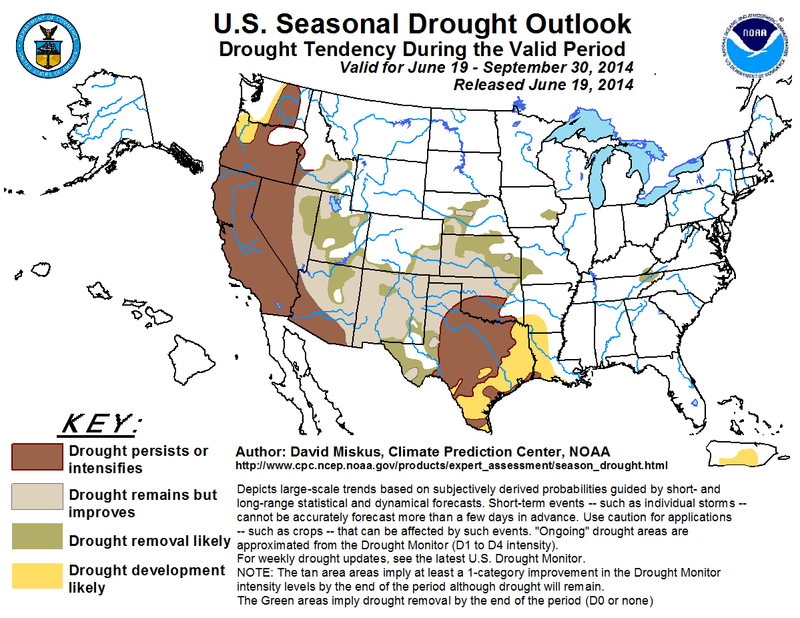 Seasonal Drought Outlook was released last week. 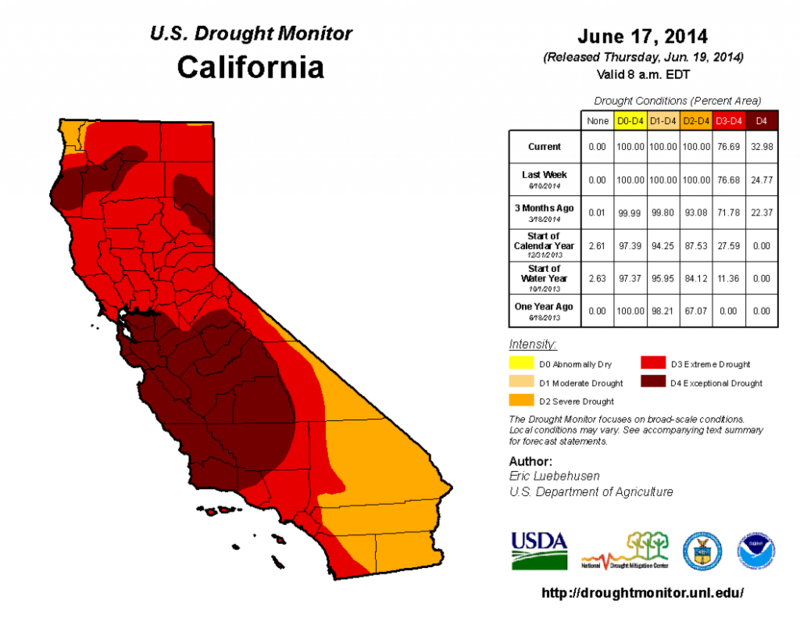 The drought in California is, unsurprisingly, expected to continue into October. 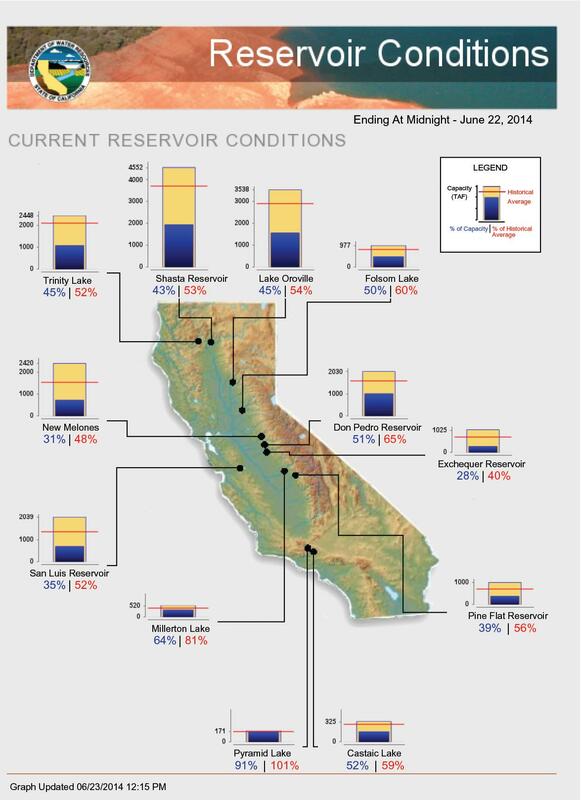 Statewide, California’s major reservoirs are at about 45% of total capacity and 59% of normal.